Whatever you call these – sub rolls – hoagies, heroes, grinders or po’boys – these can be yours in 4 hours – and much less if you’re not living with pint-sized distractions! 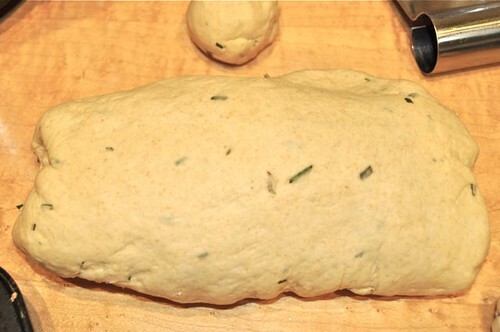 Once you get it together, (which takes about 20 minutes), you only have another couple of hours of rising, rolling and rising again, before your kitchen smells like an Italian bakery. Fill ’em with a stack of deli meats & coleslaw, curry-laced egg salad with a handful of romaine, chicken salad with sliced grapes and celery – or go hot – a mess of meatballs, sloppy joes, spicy chili or add anything off the grill – bratwurst, fish, chicken, strip steak – or simply split and toast ’em, it’s homemade bread for goodness sake and it’s bloody addictive! So with these puppies on the sidelines, a meal is whatever you want to stuff ’em with. 1. 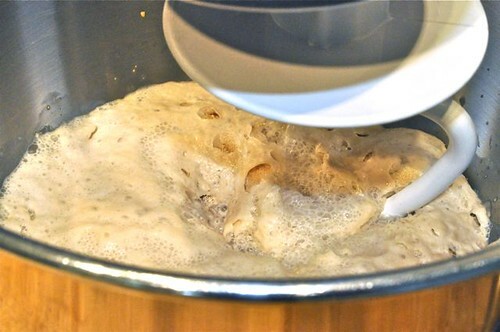 Get the water, yeast & sugar ready to come together to make some magic. 3. 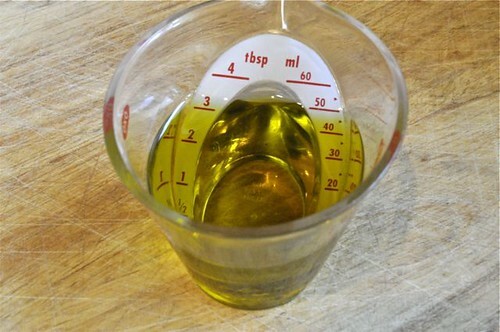 Measure the olive oil and set aside. 4. 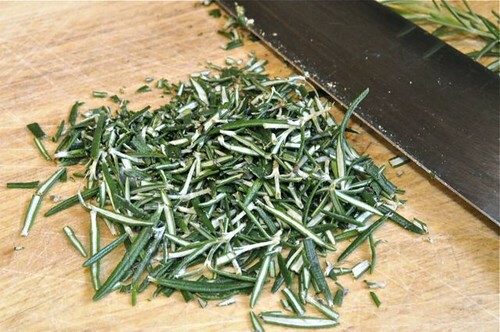 Chop up the rosemary or whatever herb you like – and feel free to use half the amount of dried. 5. 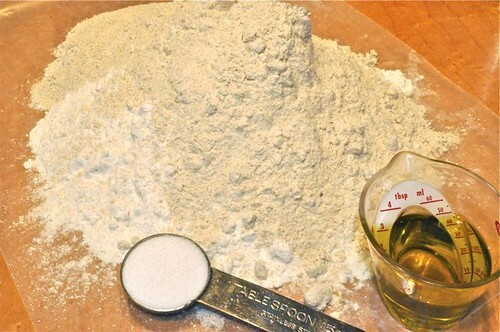 Measure the flour onto a piece of waxed paper – much easier for getting in the mixer. 6. Back to the magic. 7. 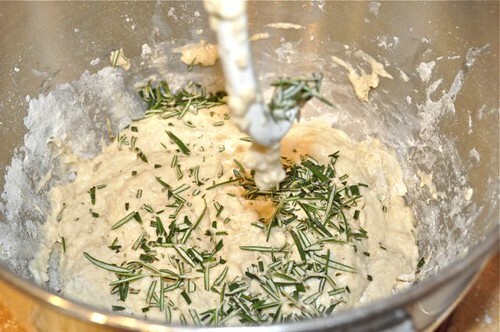 Get the dough hook in place and start mixing. 8. 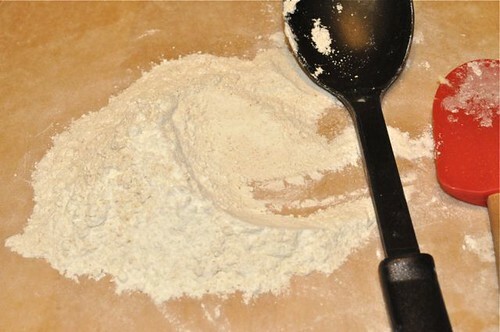 Add the flours by the heaping spoonful allowing the dough to absorb each addition. 9. 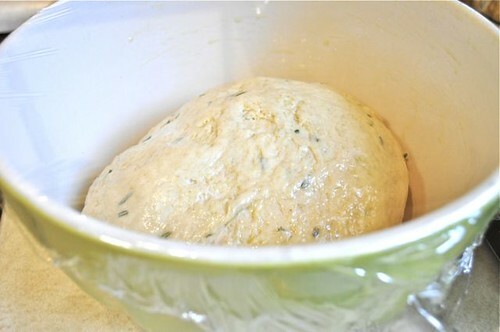 Halfway, add the herbs and keep going with the flour additions. 10. Check to see where you’re at from time to time. 11. 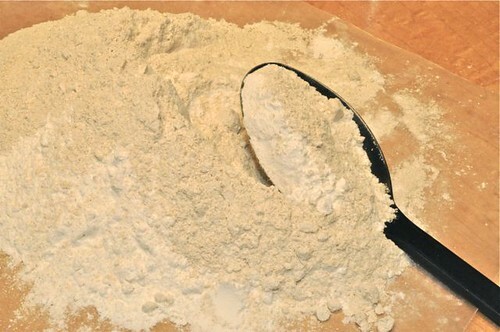 Keep going with the flour until the dough hook begins to struggle – you’ll still have flour left. 12. Until it looks like this. 13. 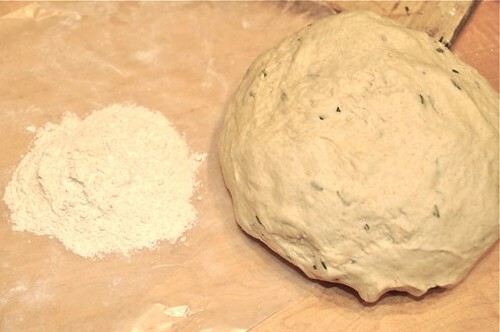 Remove the dough to the table and start kneading – it will become sticky so work in a little more flour. 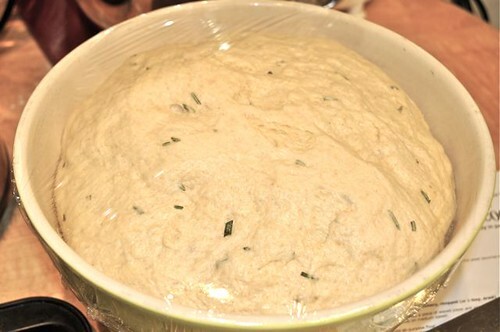 When the dough forms a soft ball, you may have a little flour left over – you’re not alone. 14. 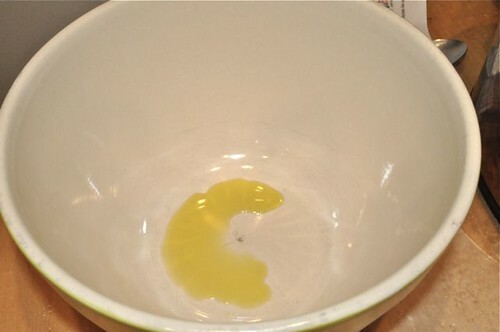 Drizzle a little olive oil in a large bowl. 15. 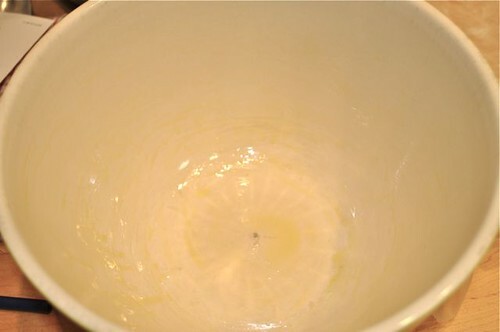 Smear it all around to coat the bowl – use a piece of waxed paper (or your fingers) works great! 16. 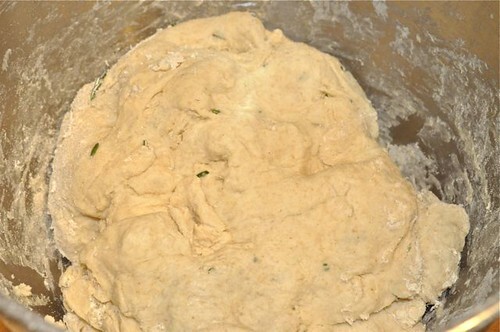 Put the dough in the bowl turning it coat. 17. And cover it with plastic wrap. Move to a warmish spot (no drafts) and leave it to double in size. 18. 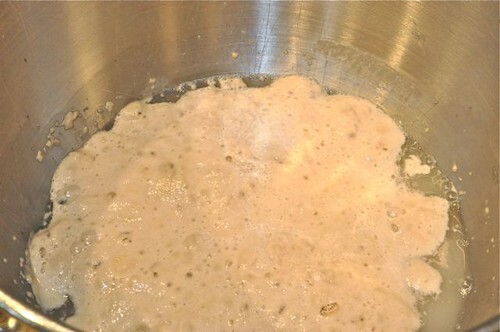 Don’t you just love the power of yeast! 19. Meanwhile, prep 2 baking pans with a quick dusting of cornmeal and set aside. 19. 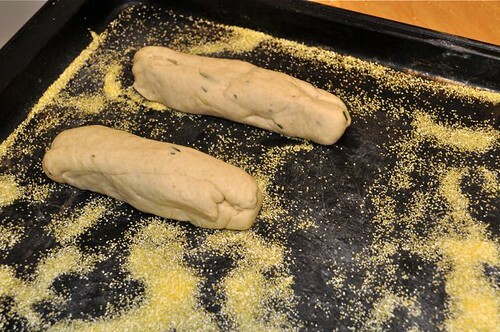 Turn the dough out onto the table and form it into a uniform shape. 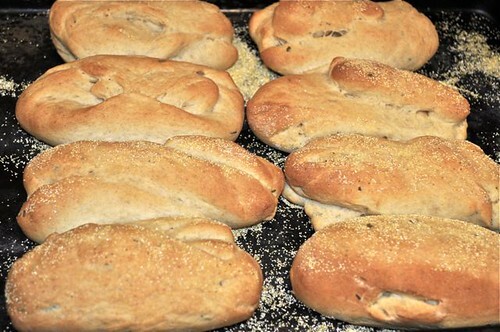 You want to make 16 equal-sized pieces of dough to shape into rolls – you can either eyeball it (not so reliable) or weigh it (very reliable). 20. If you don’t have a scale – GET ONE! I use mine every single day! 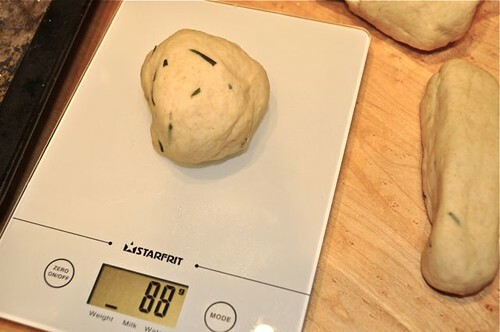 Simply weigh the whole piece of dough and divide by 16 – in this case I have about 1380 grams of dough, so each piece needs to be in the 80-90 gram range to give me 16 rolls. 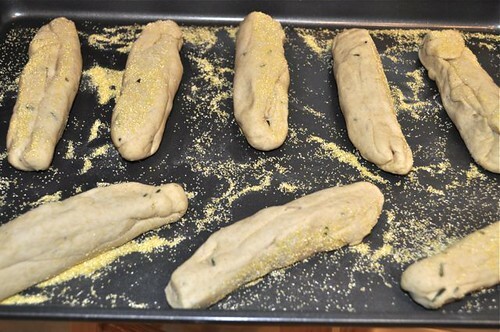 I vaguely score the dough into 16 pieces, cut off a piece, drop it on the scale, add or subtract a little here or there, and you’ll end up with basically the same-sized rolls. 21. 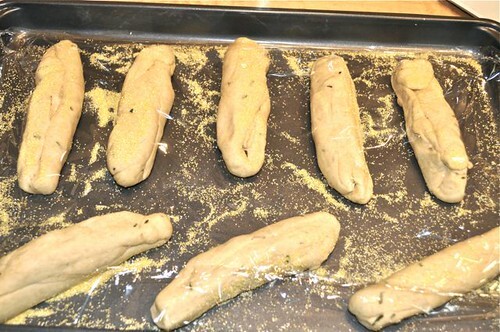 Shape each piece into a log and place it on the baking pan. 22. Keep going – you can see how the rolls are pretty much the same size. 23. Fit then any way you want – 8 per pan. 24. Cover the pan with plastic wrap and set aside to double in size. (At this point, preheat the oven to 400°). 25. See? Lovely pillows of heaven! 26. Really lovely pillows of heaven! 27. 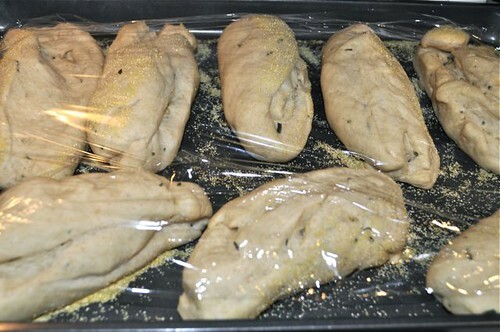 Remove the plastic wrap before putting them in your hot oven – duh! 28. 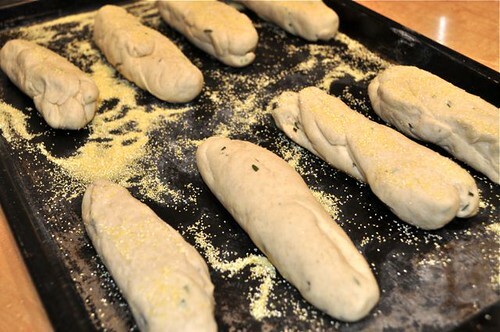 The secret to a crusty crust? A pan like this with rocks that get screamin’ hot. 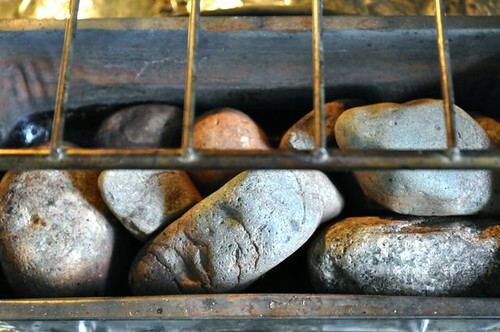 When you put your rolls in the oven to bake, you quickly (and carefully) hit the hot rocks with a cup of water and shut the door straight away – and you got the steam you need to bring on the crust! It’s the steam that makes the magic! 29. And you thought you were’nt a baker! 4. 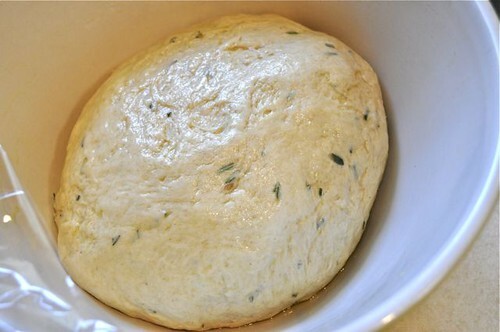 Halfway through adding the flour, sprinkle the dough with the rosemary and continue adding the flour. 5. 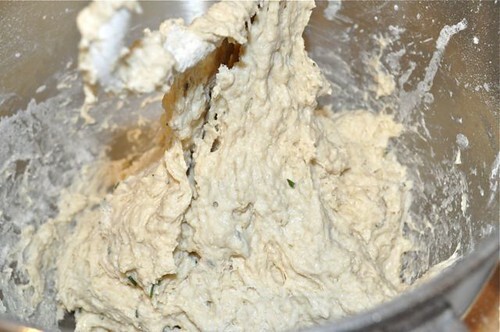 Add enough flour so the dough becomes soft and pillowy rather than sticky. 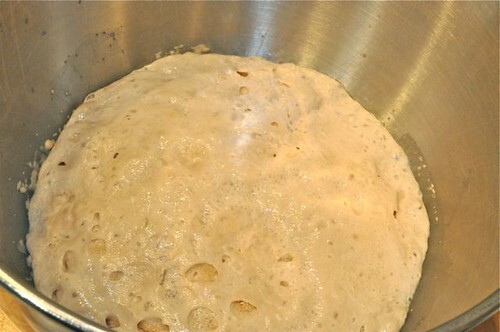 Remove the dough when the hook begins to struggle and knead in as much flour in as it can take; until a small piece can be stretched as thin as tissue paper – about 10 minutes. I often have a little flour left. 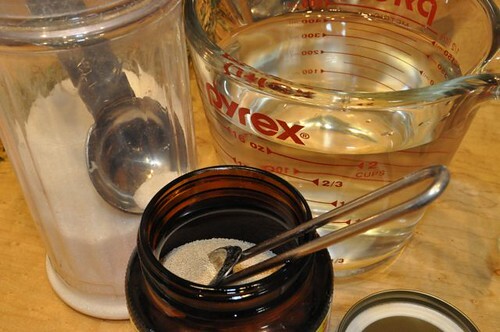 Move it to a lightly oiled bowl, cover with plastic wrap and allow it to double in size – 45-60 minutes. 6. 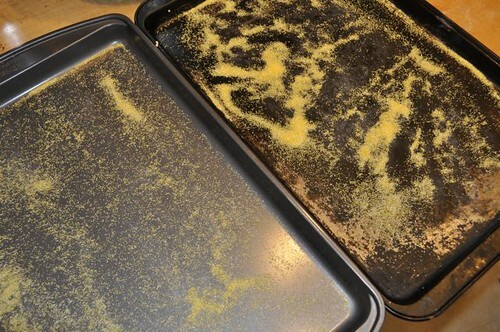 Sprinkle 2 baking pans with a dusting of cornmeal and set aside. 7. 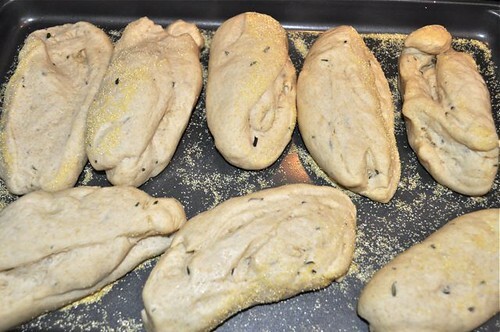 Remove the dough and divide it into 16 pieces. The easiest way is to weigh the whole piece & divide by 16 to get even sized pieces. Here, the total weight is 1380; divided by 16 gives you about 86. So I make sure the pieces are somewhere between 82-88 grams each. If you don’t have a scale (you should get one) but in the meantime, simply make a log as even as you can and score into 16 pieces before rolling into balls and then logs about 6″ long. 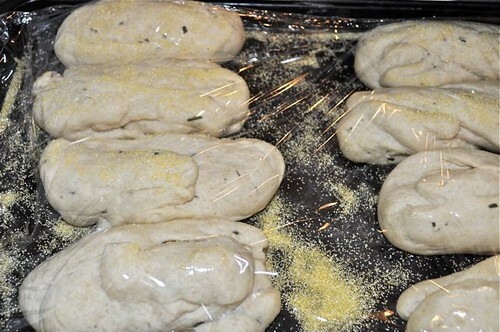 Place the rolls onto the baking sheet, cover with plastic wrap and set aside to rise for 1 hour. 8. 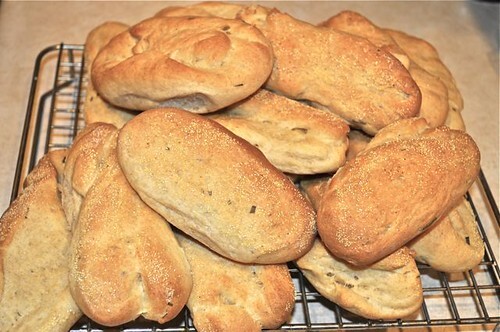 Preheat the oven to 400º F. Bake the rolls until golden brown, about 30 minutes. Transfer to racks to completely cool. Slice & stuff with whatever you like – hot or cold. If you can think of it, it can be stuffed into a sub roll!